Across the Spider-Verse: What If Spider-Man Had Joined the Fantastic Four? Home » Blind Spots » Across the Spider-Verse: What If Spider-Man Had Joined the Fantastic Four? 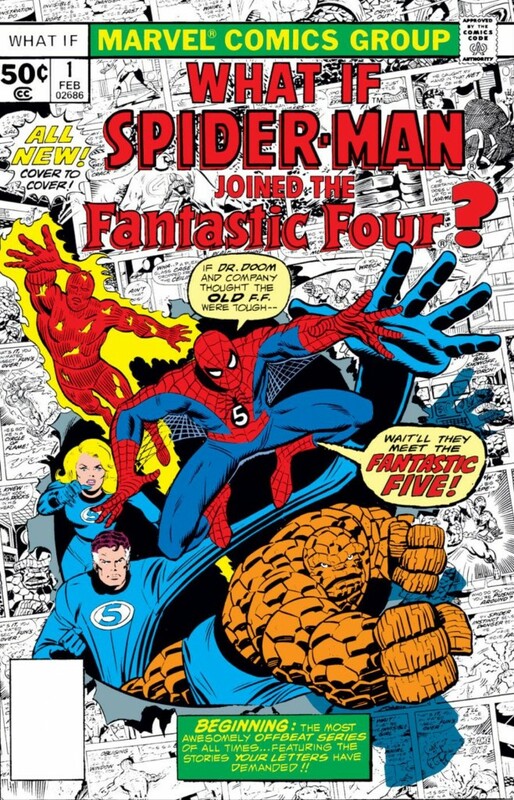 As I spend the next few months writing about comics the feature “alternative” versions of Spider-Man, I thought the best place to start this dialogue was with the very first issue of Marvel’s What If? Series from 1977. For the uninitiated, the premise behind What If? is that Uatu the Watcher (RIP) would take a key moment in Marvel history, i.e., Peter Parker being bitten by the radioactive spider, or Bruce Banner saving Rick Jones from a gamma bomb, and then examining what could happen if these events transpired differently. The storylines were treated as if they were happening on an alternative timeline – in other words, if you allowed yourself to suspend belief, you would accept that the events of What If? DID in fact happen, but on a different parallel Earth from where the “mainstream” Marvel Universe is set (which, in case you didn’t know, is considered Earth-616). Prior to What If’s publication, the parallel Earth concept had been used quite extensively by the “Distinguished Competition,” starting with DC’s landmark Flash #123, aka, “Flash of Two Worlds.” In this story, the current iteration of the Flash, Barry Allen (from Earth-1), accidentally travels to the parallel Earth-2 and teams up with his Golden Age predecessor, Jay Garrick. Don’t mistake what happens in this issue as time travel. The story takes place in the “present day,” it just involves the characters from two parallel worlds. DC would push the Multiverse concept even further when it published an annual team-up of its Silver Age team of superheroes, the Justice League, with their Golden Age counterparts, the Justice Society. Again, these collaborations did not involve time travel. Instead, the Golden/Silver Age team-ups were all made possible, in effect, because of theoretical physics (anyone out there who’s watched Donnie Darko will probably remember its “string theory” premise). Because Marvel’s predecessor, Timely Comics, wasn’t publishing many superhero comics in the Golden Age, at least not to the extent that DC was doing with Superman, Batman, Green Lantern, Flash etc., there really wasn’t much opportunity for the “House of Ideas” to have their own version of the Multiverse. Most of Marvel’s stories take place on one timestream and one Earth. But that changed with What If? For example, while the numbers don’t ultimately mean anything, the Spider-Man that is featured in What If? #1 comes from Earth-772. While there are a finite number of What If? issues that have been published by Marvel, it’s not a stretch to say that all of the other “alternative” Spider-Man stories that have been published over the years – Spider-Man: Noir, Spider-Man: Reign, Spider-Man: India, et al – are glorified What If? stories that just don’t have the “What If?” title on the front. For example, Spider-Man: Noir is just a hypothetical take on what a Spider-Man story would look like during the early 20th century. Spider-Man: Reign is a Spider-Man story set in a hypothetical dysopian future. All of these different Spider-Men hail from their different parallel Earths, like those featured in What If? While the Spider-Man from the 1967 animated series, and the mid-70s Spider-Man from Spidey Super Stories technically beat Fantastic Five Spidey to the punch in terms of being the FIRST alternative versions of Spider-Man, What If? is really the first time a creator (in this case, Roy Thomas) attempts to define that the comic being read as taking place on a parallel world/timeline. So that makes me wonder, whether it was a coincidence or not that Fantastic Five Spider-Man was the first Spidey to be introduced (and to be killed off) during the “Spider-Verse” prologue in Superior Spider-Man #32? As for my thoughts on the comic itself (this was another one of my patented long-winded introductions, wasn’t it?) “What If Spider-Man Had Joined the Fantastic Four” is a worthwhile demonstration of what the whole What If? premise is about (and one that sorta, kinda became a reality a few years ago when Spider-Man joined the Future Foundation in the wake of Johnny Storm’s death). For those looking for a historical reference point, the story takes place during the events of Amazing Spider-Man #1 when Spidey busts in on the Baxter Building because he wants to join the F4 to make some extra cash. 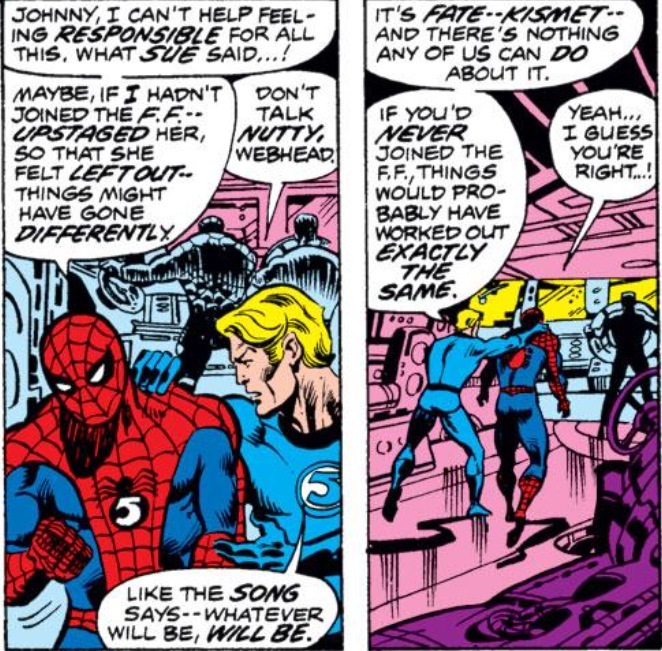 In the 616 world, they reject him and he swings away, but in What If?, Sue Storm convinces her teammates to hear Spidey out. When Reed Richards determines that the group could use a little more muscle and agility, he’s brought on board, and the Fantastic Four become the Fantastic Five. Also, Spider-Man is handed a really unimaginative costume where somebody just sews a patch with the number “5” on the chest of his red and blues. Seriously, they couldn’t have given him one of the traditional F4 blue jumpsuits (you could always have put a bag over his head if there weren’t any masks to be found). I remember reading a while back that creators loved working on What If? issues because they could really go for broke with an idea and blow everything up because the stories were always self-contained and had no bearing on 616-continuity. 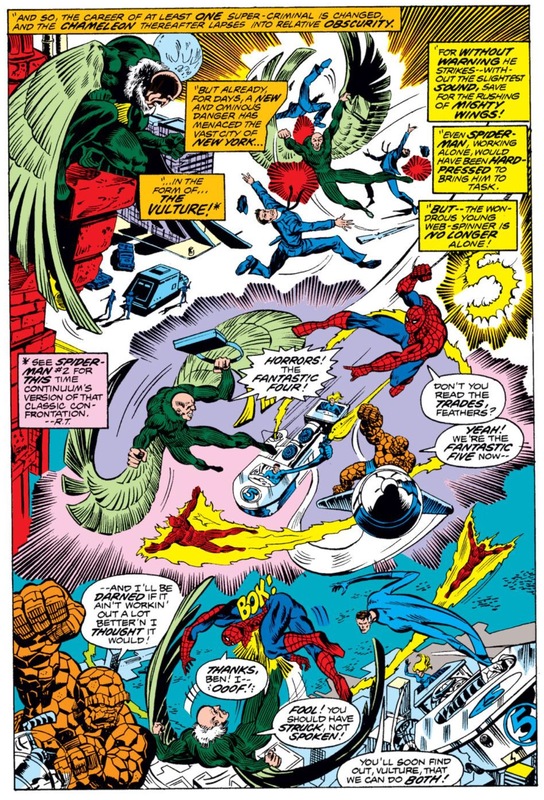 As such, even something as seemingly innocuous as Spider-Man joining the Fantastic Four would have HUGE consequences that would have otherwise destroyed the Marvel Universe as we know if these stories actually played out in the mainstream comics. That’s obviously a steep departure from today, when a certain comics has a major status quo shift almost every couple of months. While these events might impact things in the short-term, over the longer haul, there almost always seems to be a sense of order that is restored either through a retcon or some other kind of plot twist. Technically the cast of Earth-772 is revisited again in some future What If? stories (What If? #21 being one of them), but as Thomas was writing this story, he certainly didn’t know that, and not every alternative universe received a second glance. As such, there was a sense of ohmygoodness finality during What If? 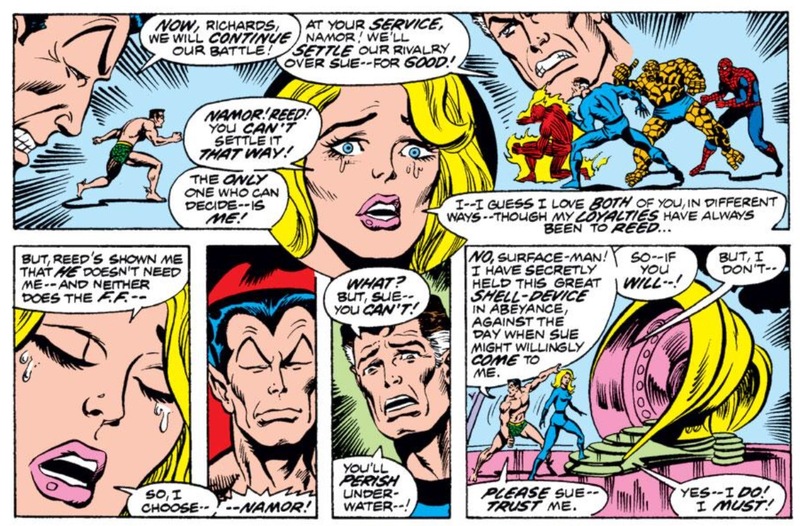 #1 in how because Spider-Man joined the Fantastic Four, and Sue felt neglected and left out and chose to leave the group to be with the arrogant ruler of the sea, Namor. There are definitely some What If? issues that have more interesting things to say specifically about Spider-Man and his character than What If? #1, but if you’ve never picked up any of these stories before and you’re curious, you really do need to do yourself a favor and check out this issue (Marvel Unlimited subscribers can find if there) to appreciate where Marvel went with the concept afterwards. We may currently be teetering on the “Edge of Spider-Verse,” but if you want to travel back to the true bookend of Marvel’s Multiverse, then I say it starts with the first appearance of the Fantastic Five. Thanks, this is a great primer for the upcoming event. I didn’t know much about Marvel’s multiverse or how it worked. This really helps. While these alternate stories are lots of fun, the idea that there are infinite alternate Earths kind of bugs me. On one hand, it almost makes 616 Spidey feel less special. On the other hand, infinite worlds means there’s a version of Spider-Man out there that has gone through all the good stories and has avoided all the clunkers, like the Sins Past and OMD/OMIT and most of the ’90s – and unfortunately I haven’t been reading that particular version! I always thought that whenever a What If? Story ends with horrible death and destruction, it got ridiculous. Like, the recent What If? Avengers versus X-Men, one little change caused THE ENTIRE UNIVERSE TO BLOW UP! It is silly.